When Driving East on Hwy 51 towards Matthews: Turn right onto Fullwood Lane at the stoplight. Turn right on South Trade Street at the stoplight. The fields and parking lot will be on your right. When Driving East on I485 towards Matthews: Take exit ramp #57 and then turn left onto Providence Road. Turn right on McKee Road at the stoplight (McKee is the next road after you pass Promenade Shopping Center on the left). Turn right onto Weddington Road at the stoplight (next to Matthews Festival Shopping Center). Then take a left on South Trade at the stoplight (the road T’s at this intersection). The fields and parking lot will be on your left. When Driving West on I485 towards Matthews: Take exit ramp #52 and then turn right onto East John Street. Then turn left onto South Trade Street (at intersection in downtown Matthews). The fields and parking lot will be on your right. From the west traveling east on 51 towards Matthews turn right on Fullwood Rd (in between Sardis and Monroe rd) follow that to the end and take a left, Matthews Elementary is on the right as you go into the town of Matthews, the ball fields are behind the school. From the east traveling west on 51 pass Presby Hospital on left, take a left at next light on Sam Newell Rd (CVS Drug is on R at intersection)follow through town 2 lights and Matthews Elementary will be on the left just past the Baptist Church, ball fields are behind school. 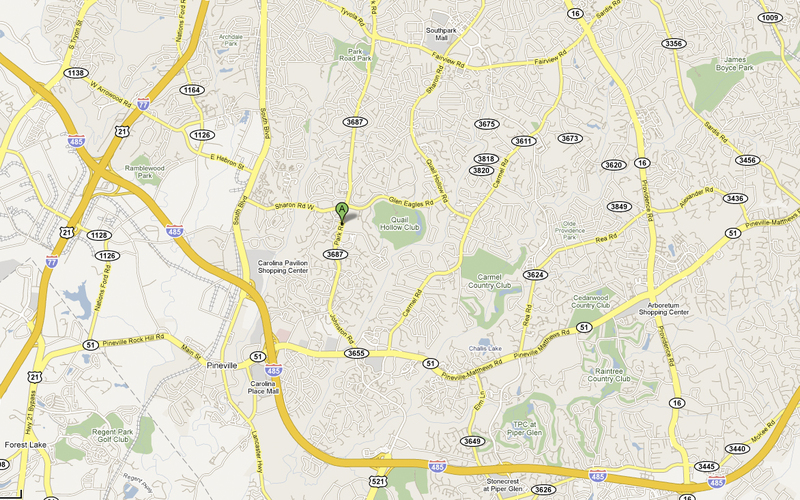 From 485 traveling East, pass Providence Rd Exit your next exit is Matthews. Take Matthews exit (#52), make a left at bottom of ramp which is Monroe Rd, go to the light in the middle of town and go left (Citgo is on left at light) Matthews Elementary is straight ahead on the left about 1 block, ball fields are in back of the school. From 485 traveling West pass Independence Blvd Exit, Matthews Exit (#52) is next take a right at bottom of ramp, follow into town until you get to the light, take left, Matthews Elementary is on left, ball field are behind the school. Take 485 east to Mint Hill (exit 44). Turn right (east) at the light and immediately get in the left lane. Make the first left onto Brief Road (there is a turn lane at the Brief Road intersection). The complex is about 2 – 3 miles on the right. There are two entrances to the MHAA fields; the second entrance is past the softball fields. Overflow parking is available behind the outfield fences at the second entrance. Note: From the intersection of 485 and Independence Blvd., your ETA is about 10 minutes. The softball fields are located at Randolph Park on Randolph Road in Charlotte. They are approximately ½ mile west of Wendover Road on the right as you head uptown. (From Southpark Mall); Take Sharon Road to Wendover Road merge right onto Wendover Road and follow it across Providence Road to Randolph Road. Turn left onto Randolph Road. The ball fields are about ½ mile on the right. (From the East): Take Sardis Road to Fairfield Road. Turn right on Randolph Road and follow it towards uptown. After passing Cotswald shopping center and Wendover Road, the fields are about ½ mile on the right. Heading northbound toward Charlotte on Randolph Rd, pass Billingsley Rd and the first driveway on the Right is Randolph Lower Field. The field is accessible either by foot through the main park (Randolph Rd Park at 201 Billingsley Rd) or parking available adjacent to the Randolph Lower Field. Coming up Hwy. 51 from Matthews, you will turn right on Johnston Rd., which will turn into Park Rd. Follow it past South Meck High School, which is on the left hand side. You will continue up just a short distance and turn right at the sign for Quail Hollow Middle School (Smithfield Rd.). The fields and parking are on your left. Coming south on Park Rd., you will pass Quail Corners Shopping Center on the right. You will make a left almost immediately after the Shopping Center at the sign for Quail Hollow Middle School (Smithfield Rd.). The fields and parking are on your left. Coming from Steele Creek., Get off 485 at South Blvd. Drive north on South Blvd to Sharon West. Take a right on Sharon West. Drive to Park Road. Quail Corners Shopping Center will be on your right. You will make a left almost immediately after the Shopping Center at the sign for Quail Hollow Middle School (Smithfield Rd.). The fields and parking are on your left. 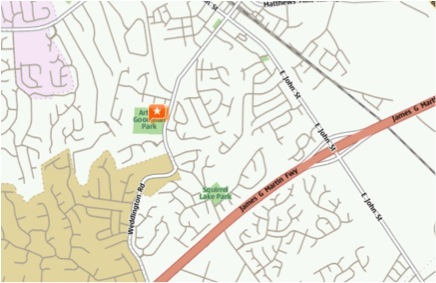 From Central & South Charlotte: Take your best course to Route 51 (Pineville-Matthews Road). Travel west on Route 51 toward Pineville. Route 51 becomes Main Street in the town of Pineville. Continue to travel west on Main Street, Reid Lane is on the south side of the street just past the railroad tracks. From I-85 take I-85 to I-485 West to the Route 51South Exit # 64B, then travel on Route 51 toward Pineville. Route 51 becomes Main Street in the town of Pineville. Continue on Main Street, Reid Lane is on the south side of the street just past the railroad tracks. The park is west of the Carolina Place Mall. Games are played at South Charlotte Middle School. From Rea road and Hwy. 51, go east on Hwy. 51 one mile and make a right at the light on Strawberry lane. Make a right into the “Park” parking lot and the fields are behind the school. From Providence road and Hwy. 51 (The Arboretum shopping center), go west on Hwy. 51 for about one mile and make a left at the light on Strawberry lane. Take 485 to exit 49 Idlewild Rd. Make a right at top of ramp. Go 2.1 miles and make a left on Indian Trail-Fairview Rd. Go 1 mile and Hemby Bridge Elementary is on left. Fields and parking are on left side of school. Take 485 to exit 49 Idlewild Rd. Make a left at top of ramp. Go 2.1 miles and make a left on Indian Trail-Fairview Rd. Go 1 mile and Hemby Bridge Elementary is on left. Fields and parking are on left side of school. From Pineville, take 51. Left on Rea Road. At shopping center, make a right to continue on Rea Road. Old Providence Elementary will be on your left. Fields are in rear of school. From Matthews, take 51. Right on Rea Road. At shopping center, make a right to continue on Rea Road. Old Providence Elementary will be on your left. Fields are in rear of school. From Steele Creek or Pineville: Head north on Highway 51 (Pineville-Matthews Rd.) past the Carolina Place Mall. Continue past the Hospital on the left and Park Rd. Turn left onto Carmel Rd. (Exxon Station on the right) Follow for about 4 mi. until the Colony Rd. light. Cross over and turn at the next right which is Camilla Rd. Go ¼ mile to the school. Make a left at the stop sign and go through the parking lot. From Mint Hill: Follow Highway 51 (Pineville-Matthews Rd.) past the Arboretum. Continue to Rea Rd. Turn right and follow Rea for a few miles. It eventually becomes Colony Rd. by a shopping center on your right. Continue to follow Colony for another mile or so to Carmel Rd. light. Turn right there and then turn right again in 100 yds. onto Camilla Rd. School is 1/4 mile down. Entrance is on the left at the stop sign through the parking lot. From Matthews: Head north on Highway 51 to Rea Rd. Turn right on Rea Rd. Stay straight on road as it becomes Colony Rd. by a shopping center on your right. Follow to Carmel Rd. light. Turn right there and then turn right again in 100 yds onto Camilla Rd. School is 1/4 mile down. Entrance is on the left at the stop sign through the parking lot. From Myers Park: Follow Sharon Rd. to Colony Rd. at South Park. Turn left on Colony, cross over Fairview and Sharon View Rds. Continue to Carmel Rd. light. Turn left and then immediately turn right on Camilla Rd. School is 1/4 mi. down. Entrance is on the left at the stop sign. From Idlewild: Follow Idlewild Rd. to Rama Rd. past Sardis Rd. as it becomes Fairview. Follow Fairview to the Carmel Rd. light. Turn left and follow past light at Sharonview. Continue about 1 mi. Turn left at Camilla Rd. School is 1/4 mi. down. Entrance is on the left at the stop sign. From Olde Providence: Go to Rea/Colony and proceed towards Carmel Rd. Turn right at the light at Carmel and then right again immediately on Camilla Rd. The school is just a 1/4 mile down. Enter on the left and go through the parking lot. Park Sharon: Turn right off of Park Rd. onto Gleneagles. Follow to Quail Hollow and turn right again. At Carmel Rd., turn left and proceed about 1 ½ miles through the light at Colony Rd. and turn right onto Camilla Rd. just after Colony. School is ¼ mi. down. Take a left at the stop sign and go through the parking lot. From Waxhaw, take Waxhaw Highway (Hwy 75) towards Monroe for 1/3 mile. Keep right onto Old Providence Rd. Go approximately 1/4 mile and the entrance to the fields will be on the left. Follow Rt. 16 (Providence Rd.) South past MAC and go down past Providence Country Club until you get to Hwy. 84. Turn left onto Hwy. 84 and go about 5 miles, you will see the fields on the left hand side. Once in the park continue to field which is past soccer and baseball fields. You will see field adjacent to turfed football field.